I've been out visiting with my Local Authority again! It was the launch of the new Carers Strategy Consultation and I was asked to speak at the event about Carers and support. Councillor Dickson (a friend to Carers! ), chaired the event and there were four speakers. The head of Social Services Iona Colvin, Tommy Whitelaw -whom I know as TommyNTour!- the new Carers Champion for North Ayrshire Councillor Robert Steel and...me! I spoke about the main issues as I see them, the importance of Carers having access to information and support and how we achieve that locally with our Carer group also the importance of online communities where the information is at your fingertips! 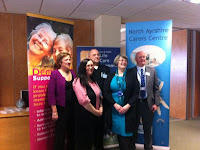 The other speakers gave an overview of the Carers strategy and we welcomed the new Carer Champion too. I'm glad we now have a 'go to' person to address Carers issues and concerns - that can only be a good thing! Tommy is an inspirational speaker! He's very passionate and shares so much of his Carer experience. The triumphs and challenges almost all Carers experience on their own personal Carer journey - thank you for sharing! It was a good event but more importantly, it's a really good strategy for Carers and that's really what we all want. If you get the chance to influence the decision makers...grab it! Lets build a better life for Carers!